With the increase of living donor liver transplantation (LDLT) cases, management of hepatic venous outflow obstruction (HVOO) that can cause hepatic graft dysfunction and graft loss has become an important issue. This report describes a case of early HVOO after LDLT which was successfully treated with the endovascular stent placement. An integrated surgical and radiological approach is required for the management of anastomotic complications in liver transplants. A 43-year-old male with a history of decompensated chronic liver disease was admitted for LDLT. Intraoperative Doppler ultrasound showed no evidence of either stenosis or obstruction of the hepatic arterial blood flow, portal vein, and hepatic vein. No areas of graft were congested. On postoperative day (POD) 1, serum glutamic-oxaloacetic transaminase and serum glutamic-pyruvic transaminase were raised to 470 and 502, respectively. Prothrombin-international normalized ratio was deranged. Routine Doppler showed monophasic waveforms involving right hepatic vein (RHV). 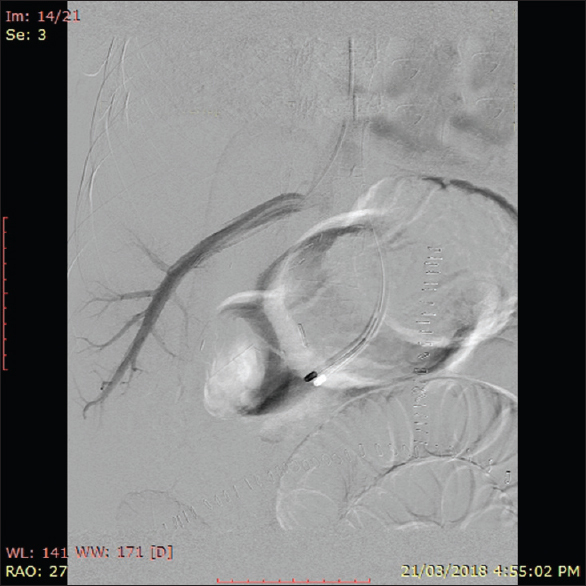 The patient was taken for angiography and underwent hepatic venography, showing stenosis of RHV at the anastomotic site with an element of torsion of venous drainage [Figure 1]. Middle hepatic vein (MHV) could not be cannulated due to acute angle and thrombosis of the whole of MHV. The pressure gradient between the right atrium and intrahepatic vein was approximately 20 mmHg. 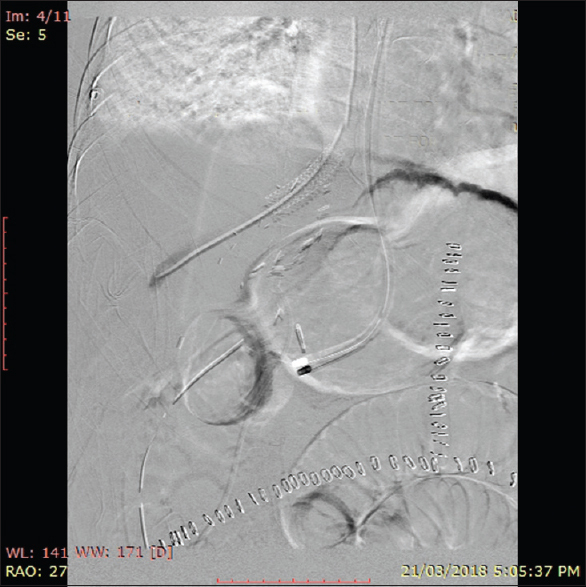 Immediately, we inserted a self-expandable metallic stent (10 mm diameter and length of 40 mm) into the RHV through the internal jugular vein, and pressure gradient across the venous stenosis was successfully reduced to 4 mmHg. There were no intervention-related complications [Figure 2], [Figure 3], [Figure 4]. The patient was extubated on POD 2. The aspartate aminotransferase and alanine aminotransferase showed decreasing trend. In the view of continuous drain output, interventional radiology opinion sought, and percutaneous catheter drainage was placed in the perihepatic and pelvic collection. He has remained asymptomatic. Right hepatic LDLT is considered to be challenging due to the presence of hepatic venous anatomical variants and complexity involved in the venous anastomosis. Early postoperative period hepatic venous complications are likely due to discordance between liver size of donor and recipient, twisting of venous trunk due to hypertrophy of liver parenchyma, and kinking of the redundant hepatic vein. Fibrosis of anastomotic site is likely to cause hepatic venous complication in late postoperative period. Small length of the hepatic vein is one of the causative factor for HVOO. Improper evaluation of hepatic venous anatomy in pre operative period leads to hepatic venous congestion. As compared to the orthotopic liver transplantation, in LDLT there is mismatch of anastomotic orifice of IVC and hepatic veins of donor and recipient, partial liver grafts grow significantly after transplantation and causes anastomotic orifice mismatch. Venous outflow obstruction can result from wide range of movements of graft in large sub hepatic space due to the twisting of venous anastomosis. The signs and symptoms of HVOO are new-onset ascites, variceal bleeding, splenomegaly, abnormal liver function test, and renal insufficiency. When the recipient is suspected of having HVOO, confirmatory imaging of Doppler and biphasic computed tomography scan should be done. Early HVOO can be determined by the monophasic Doppler waveforms, venography and pressure measurements. Most venographic studies have adopted a pressure gradient of more than 10 mmHg for diagnosis of clinically significant HVOO. Endovascular balloon angioplasty and stent placements are preferred in the treatment of early HVOO and avoids the surgical risks and helps in the management of twisted hepatic veins. Careful deployment of stents and removal of stent introducer is very helpful in avoiding stent related complications like arrhythmias and migration. Fibrotic stenosis are better managed by balloon expandable stents due to its ability to tolerate external pressure, self expandable stents have better radial compliance. Primary stenting is preferred over balloon angioplasty in HVOO, which avoids the rupture of the fresh anastomosis and may be ineffective in removing the various etiologies of HVOO in the early stage. Primary stent placements play an effective role in the management of early HVOO and have good patency rates in long term. In few selected patients Percutaneous Transluminal Angioplasty can be considered for stenosis at the IVC anastomosis. 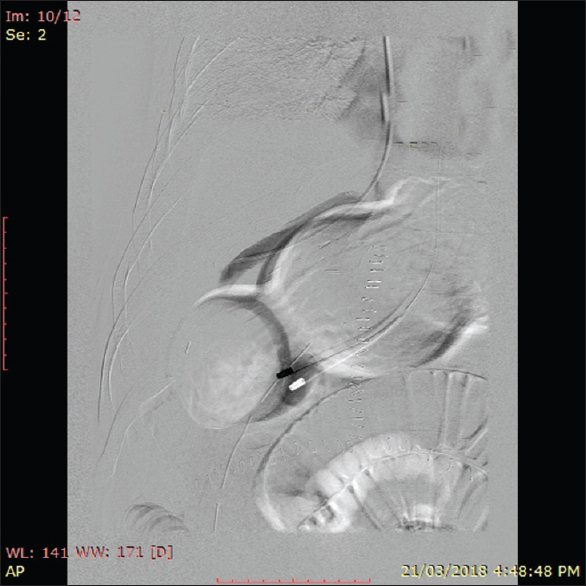 We report a case of early hepatic venous stenosis after right lobe LDLT treated by the insertion of expandable metallic stent, and the stent placement for acute venous obstruction is safe and effective even during immediate postoperative period. Expandable metallic stents are preferred in cases of early post transplant HVOO. Liu XL, Li FQ, Li X, Li B, Yan LN, Wei YG, et al. Treatment of hepatic venous outflow stenosis after living donor liver transplantation by insertion of an expandable metallic stent. Hepatobiliary Pancreat Dis Int 2009;8:424-7. Ko GY, Sung KB, Yoon HK, Kim JH, Song HY, Seo TS, et al. Endovascular treatment of hepatic venous outflow obstruction after living-donor liver transplantation. J Vasc Interv Radiol 2002;13:591-9. Yamagiwa K, Yokoi H, Isaji S, Tabata M, Mizuno S, Hori T, et al. Intrahepatic hepatic vein stenosis after living-related liver transplantation treated by insertion of an expandable metallic stent. Am J Transplant 2004;4:1006-9. Kubo T, Shibata T, Itoh K, Maetani Y, Isoda H, Hiraoka M, et al. Outcome of percutaneous transhepatic venoplasty for hepatic venous outflow obstruction after living donor liver transplantation. Radiology 2006;239:285-90. Wahab MA, Shehta A, Hamed H, Elshobary M, Salah T, Sultan AM, et al. 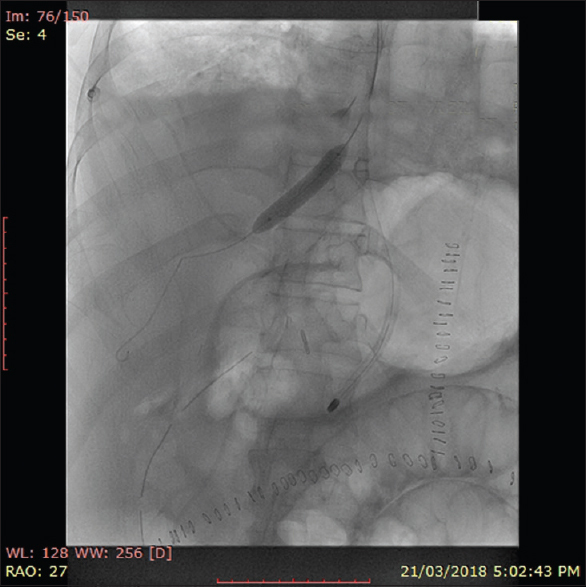 Hepatic venous outflow obstruction after living donor liver transplantation managed with ectopic placement of a foley catheter: A case report. Int J Surg Case Rep 2015;10:65-8. Chu HH, Yi NJ, Kim HC, Lee KW, Suh KS, Jae HJ, et al. Longterm outcomes of stent placement for hepatic venous outflow obstruction in adult liver transplantation recipients. Liver Transpl 2016;22:1554-61. Ko GY, Sung KB, Yoon HK, Kim KR, Kim JH, Gwon DI, et al. Early posttransplant hepatic venous outflow obstruction: Long-term efficacy of primary stent placement. Liver Transpl 2008;14:1505-11. Jang JY, Jeon UB, Park JH, Kim TU, Lee JW, Chu CW, et al. Efficacy and patency of primary stenting for hepatic venous outflow obstruction after living donor liver transplantation. Acta Radiol 2017;58:34-40. Zajko AB, Claus D, Clapuyt P, Esquivel CO, Moulin D, Starzl TE, et al. Obstruction to hepatic venous drainage after liver transplantation: Treatment with balloon angioplasty. Radiology 1989;170:763-5.